Since we first released Azure Functions, we’ve seen a lot of customers using the service to build APIs. 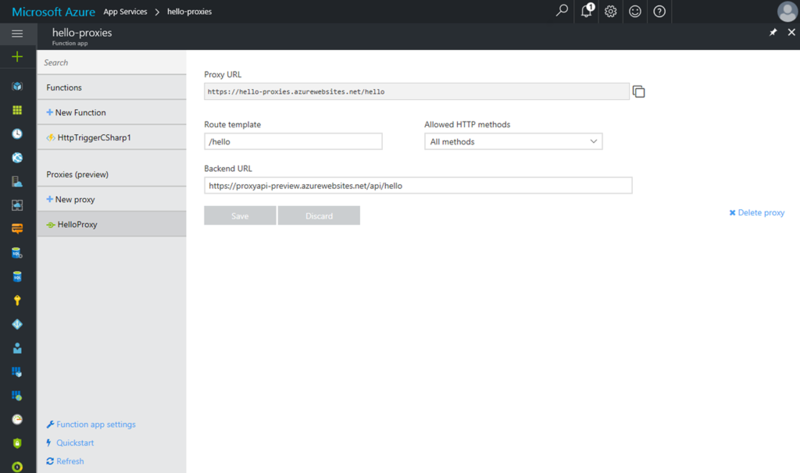 Azure Functions Proxies, now in public preview, is a new capability that makes it easier to develop APIs by using Azure Functions. Functions Proxies lets you define a single API surface for multiple function apps. Any function app can now define an endpoint that serves as a reverse proxy to another API—whether that endpoint is another function app, an API app, or anything else. Check out our documentation on getting started with Functions Proxies. For more details, read our blog post.